In the installation Was ich euch schon immer sagen wollte (What I’ve always wanted to tell you all) visitors are presented with the opportunity to use a microphone installed on the balcony. 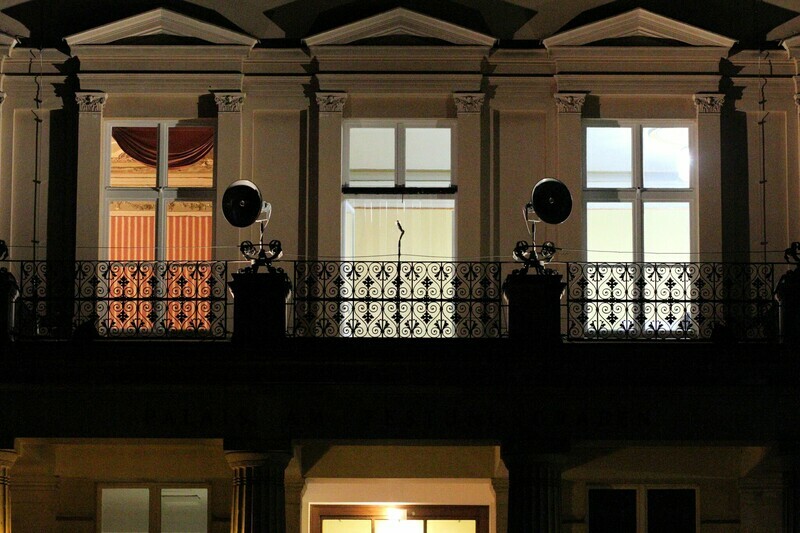 Everything said into the microphone is carried out to the public over two large loudspeakers, acting as a liaison between the exhibition hall and Unter den Linden outside. At the same time, Nasan Tur’s installation raises the question of the limits of freedom of expression. In the context of the 3. Berliner Herbstsalon, the work is, on the one hand, an invitation to de-integration – a demand to express opinions regardless of consensus and conventions – and on the other, an opportunity for an undefined audience to listen to the opinion of another and accept dissonance. Nasan Tur, born 1974 in Offenbach, is based in Berlin. Turs works were featured at documenta 14 (2017), Palais de Toyko, Paris (2015), Hamburger Bahnhof, Berlin (2014) and Taipei Biennale (2008). Solo exhibitions at Kunsthaus Wien (2016), Kunstraum Innsbruck (2014), Kunsthalle Mannheim (2011) and Kunstmuseum Stuttgart (2009).